Pakistan didn't know until late on Tuesday night whether they'd have to keep their hotel reservations in Colombo for a few more days. But when South Africa's Robin Peterson gloved a ball for a single to take the score to 122 against India, a roar went around the Premadasa. It sounded as though Sri Lanka were playing, but the noise was from a legion of Pakistan fans who were celebrating their team's progress to the semi-finals on net run rate, at India's expense. There wasn't much separating the two sides, but Pakistan were better placed because they got their tactics right and won big against Australia earlier in the evening. Spin has been Pakistan's strength in this tournament and their captain Mohammad Hafeez used his resources astutely. If that meant giving a rookie spinner the new ball and making the most experienced fast bowler wait till the 18th over, then so be it. The plan was to suffocate the Australians with turn on a sluggish pitch and it worked to such an extent that even Shane Watson had a rare, bad outing. The fielders made Australia's qualifying target of 112 seem distant. As a result, Pakistan play their fourth World Twenty20 semi-final tomorrow, but unlike on Tuesday, they will not have the lion's share of the support. 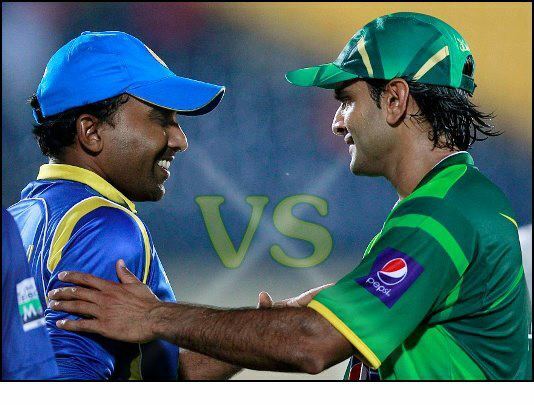 Sri Lanka are familiar opponents for Pakistan. The hosts were the more dominant side when Pakistan visited in June-July. Sri Lanka looked a more settled side in the Super Eights, making heavy weather of the chase against New Zealand (which culminated in a Super Over victory) and trouncing West Indies and England. The return of Ajantha Mendis has given their spin attack more bite and the seamers, Lasith Malinga and Nuwan Kulasekara don't offer respite. It's ironic though that the semi-final is Sri Lanka's first game in Colombo during this World Twenty20. They love playing at the Premadasa and the pitch - not as quick as the ones Pakistan played on in June - should suit their spinners. Sri Lanka haven't had a world title since 1996. They are two games away from breaking the drought, at home. Spin v spin: Opening with spin has become the norm for Pakistan. Will Hafeez adopt the same tactic against Tillakaratne Dilshan and Mahela Jayawardene, who are fluent players of slow bowling? Hafeez, Hasan and Saeed Ajmal conceded only 53 in 12 overs and took all seven wickets that fell against Australia. The two Mendises - Ajantha and Jeevan - have played vital roles for Sri Lanka as well, and they also possess a largely unknown quantity in Akila Dananjaya. Something's got to give for Shahid Afridi. He has looked a shadow of his old self with the ball, while as a batsman he remains unreliable. His three wickets in the tournament are at odds with his reputation for running through line-ups. Afridi still gets the odd delivery to grip and beat the bat, but Pakistan need more from him. His star value may not have diminished, but his wicket-taking and match-winning ability has. Mohammad Hafeez didn't drop any hints of team changes. Pakistan wouldn't want to disturb their winning combination. Pakistan (probable): 1 Mohammad Hafeez (capt), 2 Imran Nazir, 3 Nasir Jamshed, 4 Kamran Akmal (wk), 5 Shoaib Malik, 6 Umar Akmal, 7 Abdul Razzaq, 8 Shahid Afridi, 9 Umar Gul, 10 Saeed Ajmal, 11 Raza Hasan. Mahela Jayawardene stopped short of saying he would captain again after Sri Lanka's smart play-safe approach against England. He didn't hint at team changes either. Sri Lanka have lost all four Twenty20 matches they've played at the Premadasa. Of the 11 matches at the Premadasa in this tournament, only one has been won by the team winning the toss - by Australia against South Africa. "We may not have won too many finals but getting there itself shows that we have played consistent cricket." "T20 is all about giving surprises every time you play. We are trying to do that, and most of the time, we are getting some success in that. I have no idea what it will be [tomorrow], but you never know." Slim Quick Keto o The weight loss program you choose should not leave you reliant on commercial bars, shakes, supplements, or pre-made foods, for your long term success. Mira essence cream You could purchase a large collection of anti aging face cream products, each one designed to combat a different problem or do something different. Yet, most people today are opting to buy one or two creams that will do everything at once! These highly effective creams will not only combat and alleviate wrinkles and other signs of aging, but they will nourish, cleanse, and hydrate the skin as well. Keto burn xtreme review Additional studies on men and women find psychological characteristics such as "having unrealistic weight goals, poor coping or problem-solving skills and low self-efficacy" often predict failure with long term weight loss. Slim Quick Keto ng is flushed out as waste matter. But when the calories are in excess amount then it gets deposited in the different parts and the body becomes fatty, as these calories are not entirely get consumed for energy production. Nutrix Slim Keto : However, the distinction in terms of energy expenditure and body fat proved to be incredibly interesting. In this case, the body is forced into a negative nitrogen balance, that means a bigger quantity of protein is lost than what is replaced as a result of of less protein/energy intake. Weights can convert fats into muscles so making it straightforward to burn a lot of fats. Social media could be making you fat! Different health products including skincare,weightloss,muscle and male enhancement.Supplements Book is supplying 100% original and accurate information at each moment of time around our site and merchandise, and the intent is to improve the usage of good and pure health supplement. Health Discreet is a place to find honest reviews on health supplements from best of the brands. Here, customers are going to get complete information on almost every top rated product from different countries. The authenticity of our website is clearly visible through popular health blogs with the name mentioned in it. We provide our best support to the visitors seeking details of the supplements and comparisons between them.